You can easily captivate a pet lover’s attention by migrating your animal related business to the digital landscape. If you are looking to espouse an animal related cause, there is no better way to draw attention than on the web. WordPress offers many pet and animal themes that can help you captivate the heart and mind of the animal lover. Their pixel perfect features can also help with collecting funds for an animal in need. If you are making your pet’s website, or opening up your own pet training business, look no further. 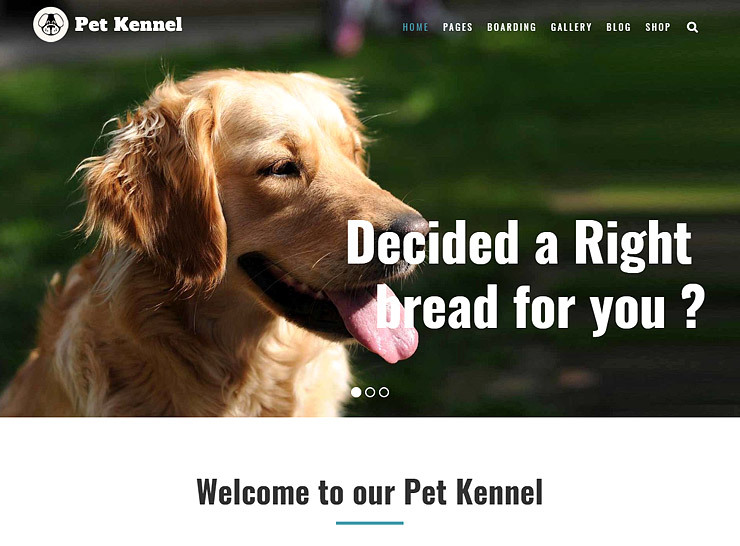 This roundup covers all that you could need to create a picture-perfect website for your pet. All these pet and animal WordPress themes themes require a self-hosted WordPress site. 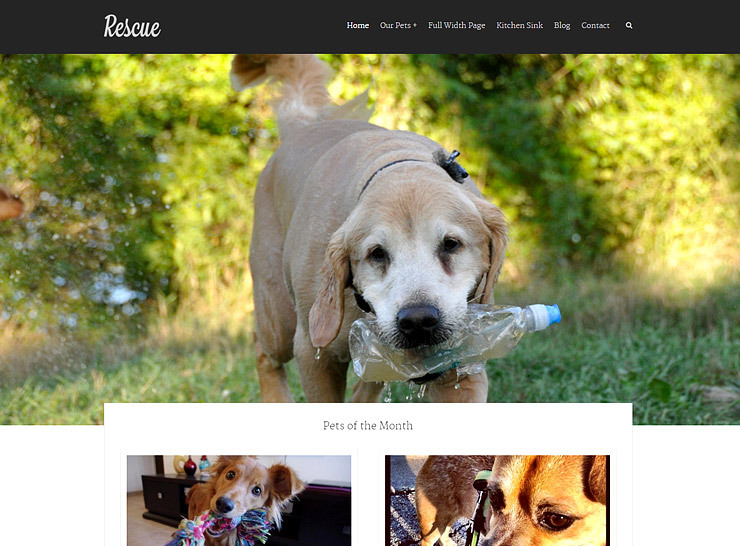 This is a purpose oriented WordPress theme for animal rescue, wildlife saving, and other animal causes. It integrates seamlessly with a number of useful plugins. It also features a robust admin panel, with plenty of options to customize your website. The theme is WooCommerce compatible and also works effortlessly with WPML, Gravity Forms, and Events Calendar. This means you can easily post upcoming campaigns or create a form for signing up volunteers. Moreover, you can translate the content for a local audience and take in online donations. In addition to plugin support, the control panel includes a versatile library of shortcodes to customize site appearance. You can, for instance, add premium sliders like Slider Revolution or other animation elements to any page on the site. There are also numerous options for color schemes, font styles, and content templates. Alternatively, you can use custom post types to highlight important information or imagery. Finally, you can also use special header layout options and section options to categorize related information and decide how it looks on your website. SEO ready and widget friendly, Pet Rescue offers the perfect blend of features to support your pet or animal-related cause. 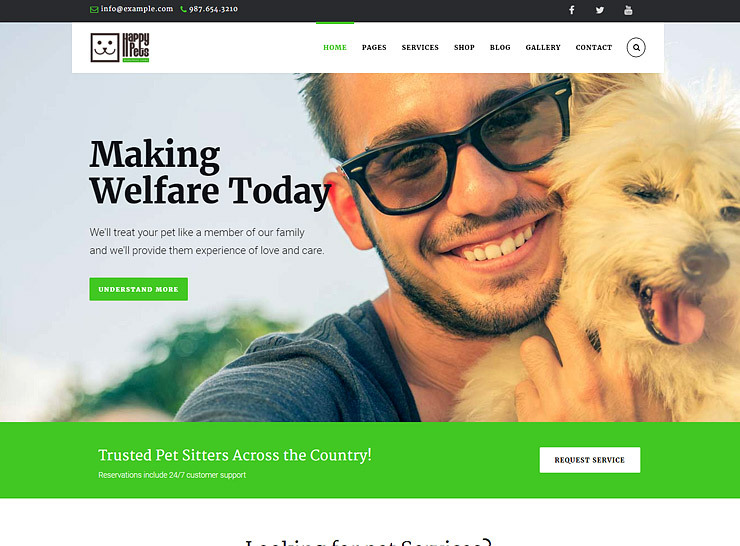 Pets and Vets is a bright and colorful animal WordPress theme. Any animal-related businesses like a pet shop or a veterinary clinic would easily be able to adopt this theme. It also offers the perfect feature set for opening an online shop as this theme is WooCommerce compatible and has the flexibility to work well with other plugins as well. All theme settings and shortcodes are available in the admin panel and are easy to use and understand. The key feature, however, is the colorful artwork of the theme, featuring animal cartoons and other distinctive hand drawings. The art work is retina-friendly and looks great on all devices. The design files are included in the package so you can use the same art work on your printed stationery like business cards. 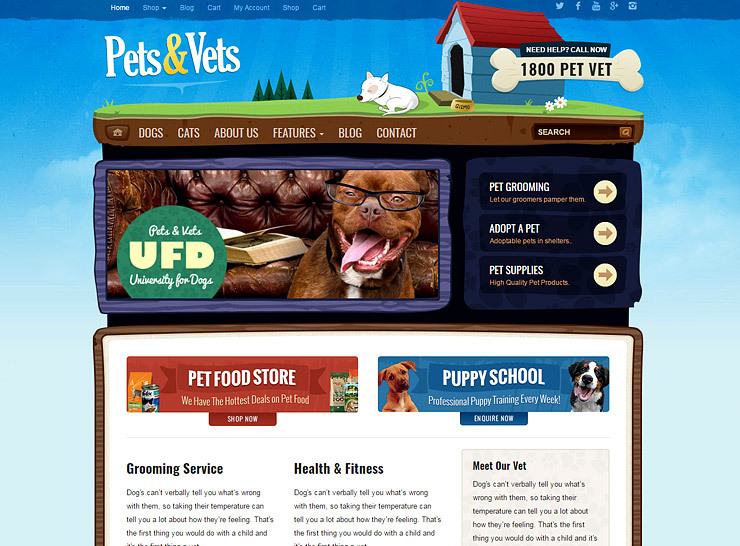 Pet and Vets also offers access to multiple Google Fonts and Google Maps. Demo content is also available with easy to understand documentation to have you up and running quickly. Pets Club is a clean looking animal WordPress theme, which is great for those new to the online arena. It offers a smart selection of features for setting up an animal blog. However, it also supports popular plugins to commercialize your site. At first sight, the interface is simple with a basic color scheme and parallax background. However, you can use Visual Composer and fancy sliders like Slider Revolution to add your distinctive flavor to your site. There are many shortcodes as well to spruce up site elements. Moreover, the theme supports WPML for content translation and WooCommerce for eCommerce. Pets Club comes with one click demo install as well as thorough documentation for quick and easy website setup. 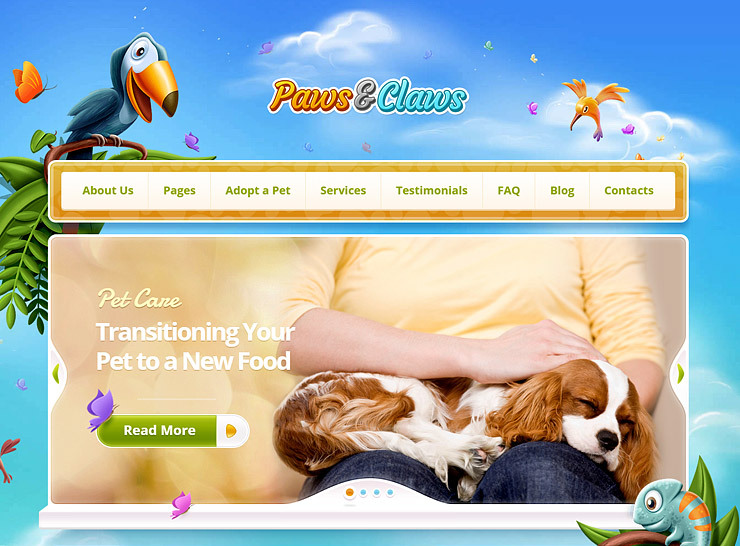 This is a bright and vibrant theme for pet lovers and pet businesses. It offers all the basic ingredients for setting up shop by supporting WooCommerce. You can select from up to 10 page layouts and further personalize them using the WordPress Customizer. The site appearance is completely in your hands as you can easily add header sliders, custom backgrounds and custom sidebars. You can even upload high resolution imagery and adjust image thumbnail size to your liking. It also works great with the Visual Composer page builder giving it great flexibility in page design. Pet Store is translation ready and offers one click demo install. It also works with some very popular plugins, like Visual Composer, Essential Grid, and WooCommerce. It is the perfect blend ready for quick installation, design, and setup to go. True to its name, Happy Pets a bright and cheerful animal WordPress theme that will bring a smile to any pet lover’s face. It features support for a diverse and vast set of plugins, widgets and shortcodes, easily accessible from the admin panel. There are many advance options for layout composition and typography settings. You can easily add any number of pages designed with Visual Composer. You can choose from up to 10 headers and 19 widgets to add your own style to these pages. You can also add parallax or video background on selected pages. Furthermore, there are unlimited color schemes and Google Fonts available. With MailChimp, you can add a subscription and login option on either the sidebar or footer. It also features support for WooCommerce and WPML, with RTL options. Your memorable blog or online store is just a few clicks away with this theme. 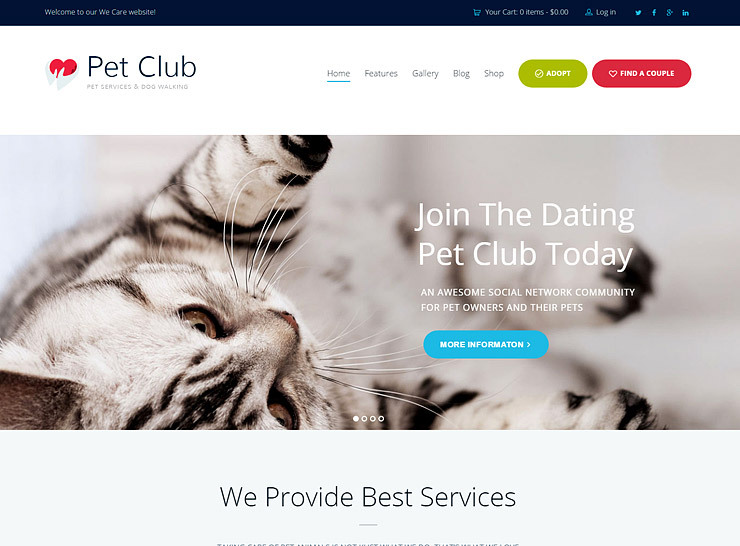 Pet Club is a versatile pet WordPress theme that can easily adapt to your business need. In addition to a feature rich admin panel, the theme is WPML compatible and WooCommerce ready. The powerful admin panel features 5 homepage styles, each with its own persona. Once your homepage is final, you can use Essential Grid, a handy plugin for displaying files or posts. Furthermore, you can add an events page using the Events Calendar plugin. Also, you can create a community of like-minded animal lovers using BuddyPress. Finally, you can display great images using slider plugins such as Swiper Slider and Slider Revolution. 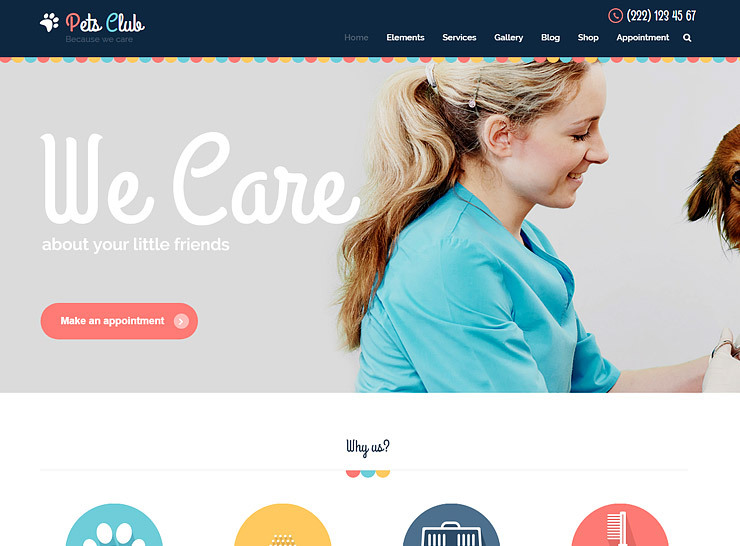 Pet Club is a feature rich theme perfect for a pet store or a pet blog. For a novice user, this animal theme is perfect for a quick website design. 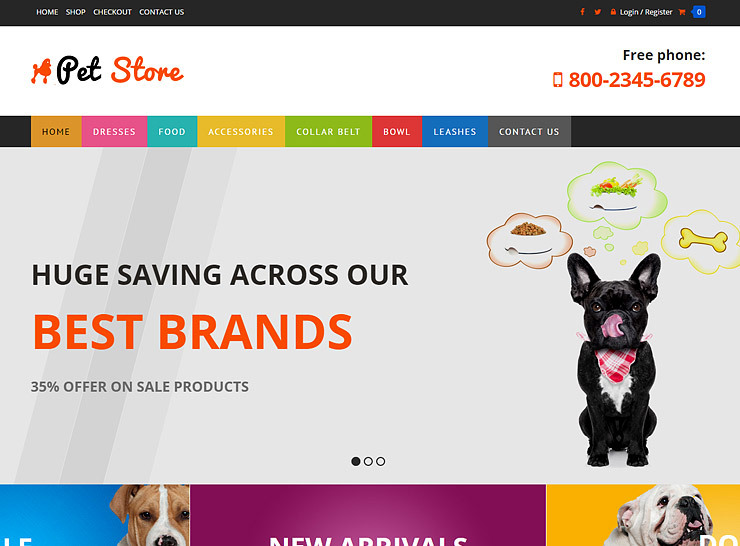 Pet Care is bright and colorful animal WordPress theme. It is multipurpose so it can serve as a vet business site or a pet store or even an animal shelter website. This theme is WPML and WooCommerce ready. It also supports other key plugins and has a robust admin panel. The theme features 5 unique homepage styles with multiple header and footer options. You also have 6 slider options like the Master Slider or the FlexSlider to add some charm to your site. You can use the Xpress page builder to add as many pages as you like with great customized design. Moreover, you can use BuddyPress to create a community around your site. This theme is easy to install with preset demo content and thorough documentation. 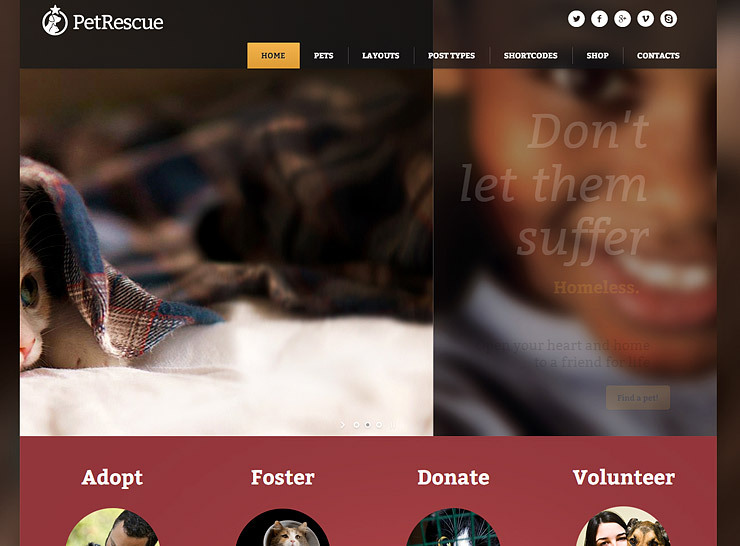 Rescue is a single purpose animal WordPress theme. It is set up to depict only an animal rescue site so all site elements and plugin support are geared towards this purpose. Its key feature is a Petfinder API. You can manually add pets to the site. However, with this API, your site will continuously sync with Petfinders database and show the latest profile for each pet. There are many color options for the header, footer and buttons. In addition, you can use shortcodes for Gravity Forms, WP Email Capture and Google Maps. You can also categorize your pets into different sets and upload their pictures on a beautifully crafted gallery page. There are easy instructions to set up your website easily. This theme is perfect for the novice user who has a great interest in animal rescue but limited coding knowledge. 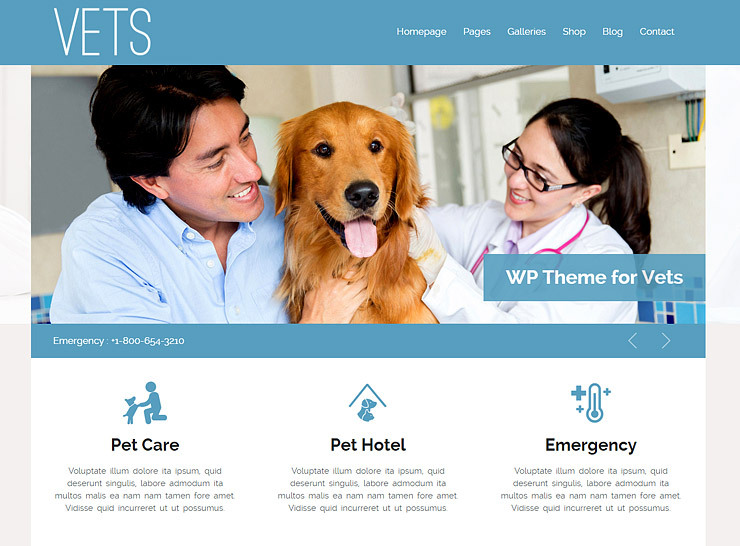 Vets is a purpose oriented WordPress theme – if you are looking to extend your veterinary business to go digital, then this theme offers the right blend of features for you. The site has a beautiful and smooth interface. The admin panel has many user friendly shortcodes as well as widgets to choose from. There are multiple colors and fonts available, as well as a plethora of vet icons to highlight site elements. Additionally, you can place a Google Map on the site to earmark your clinic location. There are also attractive display options for the homepage like carousel. Plugin support includes WooCommerce, WPML, Contact Form 7, all necessary elements for an online vet. It is also easy to install and boasts of thorough documentation. Paws & Claws is a mobile friendly and creative animal WordPress theme. It offers a distinctive set of illustrations to emphasize different site elements like pet categories. It further offers plenty of shortcodes to add events calendar, doctors profile and pricing information. The theme comes with multiple slider options, event calendar feature, multiple color choices, MegaMenu and more. The theme is packed with predefined pages such as adoption page, services, about us, appointments, testimonials and pricing. This makes the theme flexible and easy to use. The savvy user may want to design their own pages, but the novice user has the option to pick and choose the relevant pages and develop their website quite quickly. The theme offers more in terms of shortcodes, unlimited sidebars, appointment module and more. Paws & Claws is perfect for the user who wants to create a creative and beautiful animal website without having to work with a lot of coding. This is a wonderful list. I already found two I will implement. Thanks!